Kansas State University is one of the few master level theatre programs in the U.S. which offers a concentration in drama therapy. It is offered through the School of Music, Theatre, and Dance graduate program. One of the strengths of the program is its strong theatre base and opportunities for creating drama-in-education, theatre-in-education, or issue-based community projects. Service learning and internships are incorporated into courses to provide students with direct client contact experiences. 53 semester credits are required, including a minimum of 8 courses (24 credits) in drama therapy, 1 course in electronic research methods (1 credit), 7 credits in drama therapy practicum/internship and supervision, and 6 electives (18 credits) in Research Methods, Developmental Psychology, Abnormal Psychology, Group Dynamics, Theories of Personality, and Multicultural Counseling from the departments of psychological sciences, counseling and student development, educational leadership, family studies and human services, marriage and family therapy or anthropology. Students’ Masters Project (3 credits), Reports (2 credits) or Theses (6 credits) will focus on an aspect of drama therapy. These written projects will be presented to the student’s committee in an Oral Examination. Students begin their first year with general overview courses on the field of drama therapy: Principles of Drama Therapy, Creative Arts Therapies, Drama Therapy with Special Populations, Workshop in Playwriting, and Research Methods in Drama Therapy. These courses cover many of the basic theories and techniques of drama therapy. The over-arching theoretical framework followed by the program is Renee Emunah’s Five Phase Model of Drama Therapy. Workshop in Playwriting is designed to help students feel comfortable with the playwriting skills necessary for creating original plays with groups of clients. In conjunction with Principles of Drama Therapy, students begin their first internship. If they have a population they would prefer to work with, every effort is made to arrange an internship in the Manhattan or nearby communities with that group. Many students opt to join The Barrier-Free Theatre, a theatre troupe for actors with and without disabilities, that every year creates an original one-act play. This group is a partnership with the Drama Therapy Program and the City of Manhattan Parks and Recreation Department. First-year internships concentrate on Emunah’s Phase One and Two, in order to help students develop leadership skills in creating group cohesion, trust, and the ability to play with group members. In the summer between their first and second year and during winter intersessions, students have the opportunity to begin to deepen their drama therapy skills with courses in Sociodrama or Psychodrama, drama therapy with specific special populations (adolescent, hospitalized and grieving clients, older adults, etc. 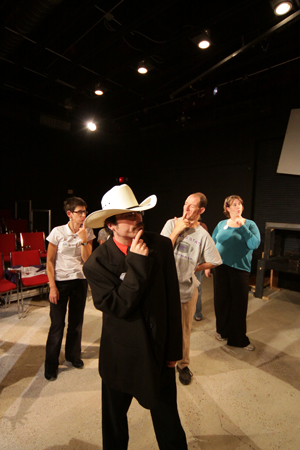 ), Playback Theatre, and other advanced electives taught by guest instructors who are specialists in these drama therapy techniques. During the summer students can also take their Multicultural Counseling course which is offered online. During their second year, students work on a creative project/paper which could be an original performance, a drama therapy group targeting a specific population, or in-depth research into an aspect of drama therapy. Creative projects should focus on theatre and therapeutic skills which students want to hone as well as on expanding the student’s knowledge of a specific target population. The second year is also a time to explore courses relating to ethics, psychology, and specific areas of interest. A second internship is undertaken with a different population (NADTA requires 800 internship hours with a minimum of 2 different populations), so that by graduation internship hours are completed. Emphasis is put on developing collegiality and a positive, supportive community with other students in the program. Learning to give and receive support from colleagues is an important tool to develop while in graduate school. Drama therapists do not always work in institutions with other creative arts therapists, but when they do, they need to learn how to work together as a team. When they don’t, creating community with other staff is crucial, as is reaching out to your drama therapy family in other places. Developing abilities for self-care and self-reflection is highlighted at K-State. No matter how you slice it, graduate school is a stressful place – it is meant to be a crucible that presses you to hone your skills and shape your philosophy of practice. Simultaneous with working hard, however, students need to learn how to de-stress in order to stay well and create healthy boundaries. Self-reflection leads to strong critical thinking and ethical skills. Self-care leads to keeping oneself safe from burning out in the professional world. Upon graduation from the K-State Drama Therapy program, students have a strong grasp of the fundamentals of drama therapy, a specialized knowledge of at least one client population, experience leading groups in a variety of settings, an understanding of ethics, and knowledge of how to approach work with a new population.